Most people who come to Japan will not miss the Hiroshima Peace Memorial Museum (also called the “Peace Park”) in Hiroshima city which commemorates the bombing of the city by the USA in 1945. This first-hand experience with an atomic bomb is largely responsible for Japan installing Article 9 of their constitution which stipulates that Japan will never again go to war. As a result of Article 9, children have peace education in schools and various “sightseeing” spots around Japan remind people of the dangers of war. “Peace” is still very much in vogue, despite the current controversy regarding Article 9 and the participation of Japan’s Self Defense Forces in Iraq. While Hiroshima is the main draw for most foreign tourists, the Japanese themselves don’t just stop with a visit to the Hiroshima Peace Museum. There are several other places to see and learn more about WWII and the events that led up to the atomic bombing. Accessible by ferry from Tadanoumi, a small town near Takehara in Hiroshima Prefecture, this island is famous as a site where they made poison gas for possible use on the enemy until the end of WWII. Such was the secrecy of the site that they took the island off the maps so the enemy couldn’t find it. 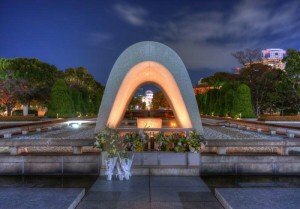 Now, school groups and individual Japanese tourists come here to be reminded of the tragedies of war. There is even a museum that details the effects of the poison gas on the people who worked in the poison gas factories. There is a good visitor’s center and a campground as well as a hotel and rental bicycles. You can cycle around the island in about an hour. The only permanent residents of the island are the friendly but wild rabbits which are everywhere and add a nice touch to a still very beautiful island.